Over the past few years, birders have watched the steady annual growth of the Cliff Swallow colony that has chosen to set up residence under the east eave of the R.L. Filtration Plant at the south-west corner of Sam Smith Park. Yesterday's count showed seventy nests. 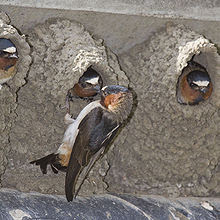 Cliff Swallows breed in large colonies. They build conical mud nests and lay 3-6 eggs. The natural nest sites are on cliffs, preferably beneath overhangs, but man-made structures are now the principal locations for breeding.